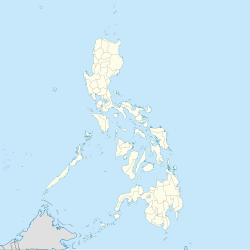 Tagoloan, ( Cebuano: Lungsod sa Tagoloan) officially the Municipality of Tagoloan, is a 1st class municipality in the province of Misamis Oriental, Philippines. It is located to the east of Cagayan de Oro City and located south-east of the Macajalar Bay. According to the 2015 census, it has a population of 73,150 people. Its name (Tagol-wan) originated from the words tago, which means "hide", and lo-an, which means "to negotiate". It is a residential and industrial municipality, and has five high schools, three colleges, and two hospitals. Tagoloan is about 19 kilometres (12 mi) from the provincial capital of Cagayan de Oro City. Tagoloan total land area of 7,938 hectares represents 2.24 percent of Misamis Oriental’s total area of 354,770 hectares. Among the barangays, Sta Ana is the largest, comprising 37 percent of the municipality’s land area. Barangays Rosario, which includes contested areas between Municipality of Tagoloan and Municipality of Malitbog, Bukidnon and Sta Cruz, occupy relatively bigger areas (11.2%) than the other nine barangays. The land area of Tagoloan is suitable for six major uses, which include protection forest, plantation forest, rice, tree and vine, pasture and cultivated crops. About 2,405 hectares or 30 percent of Tagoloan’s total area are suitable for forest uses. Rice land is suitable for 2,199 hectares or about 28 percent, while the cultivation of annual crops are suited for 2,024 hectares or about 25 percent. Tagoloan River that is located beside Barangay Poblacion is the 13th largest river system in the Philippines. Tagoloan is politically subdivided into 10 barangays. Note: Barangay Rosario includes contested areas between Municipalities of Tagoloan and Malitbog, Bukidnon, equal to 658.5 hectares (1,627 acres). In the 2015 census, the population of Tagoloan, Misamis Oriental, was 73,150 people, with a density of 620 inhabitants per square kilometre or 1,600 inhabitants per square mile. Majority or about 80% of the people in Tagoloan are Roman Catholic. The Church of Nuestra Señora de la Candelaria, also known as the Tagoloan Church, is situated beside St. Mary's Academy of Tagoloan and fronting Tagoloan Plaza. The current parish priest is Rev. Fr. Enerio Tacastacas and his assistant vicar is Rev. Fr. Vincente Cervantes. The image commemorates the Presentation of Jesus at the Temple. Its feast is on 2 February. Agriculture plays a major role in Tagoloan’s economy especially towards supporting agri-industrialization. But because of its industrialization and urbanization, Tagoloan’s agriculture land areas have been permanently diminished. During the last five years,[when?] a sizeable agricultural area was virtually unproductive due to encroachment of industries in prime tillable land. The major agricultural crops in the area are corn, coconut, mango, peanut, rice, banana, and papaya. Poultry production, particularly chicken, increased from 70,000 birds in 1995 to 136,542 in 1999, and continuously rose to 226,452 birds in 2002 to 374,000 birds in 2003. The increase in poultry production was mainly due to the advent of broiler contract growing in the area. Multinational companies led by Swift, San Miguel Corporation, and Vitarich contributed to the growth of poultry production. The cattle population of Tagoloan has decreased from 2,356 heads in 2002 to 1,102 heads in 2003. Carabao, swine, and goat-sheep populations decreased in production due to lack of interest in raising them and the high cost of investment. There are three fishing grounds in Tagoloan, Barangays Baluarte, Sugbongcogon, and Casinglot Macajalar Bay. Volume of catch from Baluarte – Macajalar Bay amounted to 4,500 kilograms (9,900 lb) per month. In Casinglot – Macajalar Bay, the volume of fishes summed to 2,115 kilograms (4,663 lb) per month and Sugbongcogon – Macajalar Bay to 90 kilograms (200 lb) per month with an estimated total volume of catch of about 80,460 kilograms (177,380 lb) per month in 2003. ^ a b c d "Municipal Profile - Tagoloan". nscb.gov.ph. Retrieved 31 January 2016.